The Franciscan Missions in the Sierra Gorda of Querétaro are examples of the mid-18th century second phase of evangelization of Mexico. They were founded by Junípero Serra of the Franciscan Order, who also founded important missions in Alta California. We've visited 4 out of 5 missions inscribed in this WHS during our Queretaro trip on October 2014. The missions are very similar and they show some of the characteristics of the about 2 centuries older missions around Popocatepetl, like the open chapel at the side of the church. Luckily for us the restoration project seen by Paul Tanner is over, and all the facades look like they've just been cleaned (they are protected only with a net, probably against birds). It took about 3.5 hours driving from Queretaro to Jalpan. We first visited Mission Conca, which shows many mesoamerican elements in the facade (climbing lions, "indio" faces, many natural elements). Mission Jalpan shows more traditional catholic elements (only saints and natural elements). Mission Landa was the most spectacular for us, showing both religious and mesoamerican elements. It also shows the representation of 2 religious sitting with a desk (one each side of the facade), with a 3-D effect which we found amazing. Mission Tilaco had the particular feature (as in Landa) of the sirens (marmaids) on the facade. We only missed the mission of Tancoyol due to time constraints. Out of the 4 missions visited, only Mission Jalpan is at the center of a very active urban center. We found Jalpan as a true gem in the Sierra (it's indeed a so-called Pueblo Magico). The Sierra Gorda itself it's spectatular with the many natural wonders, its aspect varying from desert (with many cactus) to forest to jungle. We loved this 2-day trip from Queretaro!! My name is Colin Robinson. I live in Houston Texas and my wife is from Guanajuato. I had the wonderful experience of traveling to La Sierra Gorda back in September of 2010 and I am returning for another visit after Christmas of 2011. I must say that my experience traveling throughout the Sierra Gorda was an absolutely amazing trip through a land that does not have an equal. In San Joaquin, I visited a pristine cave, went to explore some ruins known as Las Ruinas de la Rana and saw some of the most beautiful forested areas that exist in nature. Truly an unblemished spot on earth that has changed very little since its creation. One of the most amazing things about the area is its bio-diversity due to its geological variations within such a short driving distance. If you go, be prepared to experience tropical rain forests, crystal clear rivers, gorgeous desert mountain scapes, magnificent caves and a vast panoramic landscape that will take your breath away. All I can say is that if you ever wanted to see some of God's masterpieces, go to La Sierra Gorda. I am getting my bags packed for my next trip. I can't wait!!! We visited the five missions in the Sierra Gorda area in 2007. We are from Lompoc, California, USA. We have visited all of the missions in California and other states. We flew into Quanajato airport, rented a car, then drove to Quetero for 2 days. We drove from there to all five of the Sierra Gorda Missions...stayed one night in Jalpan. We continued on to Xilitla and the Las Posas...the Gardens of Edward James, staying in his home(El Castillo). Was a great trip...driving back to San Miguel Allende for a few days, which we have visited before...2nd stay at Casa de la Cuesta. Overall a great & memorable trip. We have seen all the California missions and several in Arizona, New Mexico and Texas...so we were on a quest. 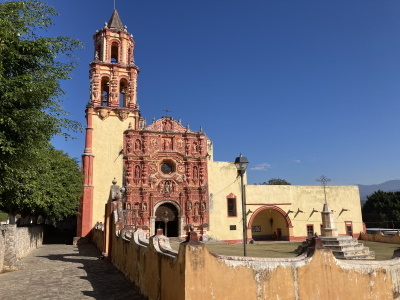 If (as we did) you travel round Central Mexico on a “World Heritage quest” you are going to look at a lot of churches, cathedrals, missions, convents and monasteries dating from the 16th to the 18th century! The problem for the non expert (which includes us!) is what to make of all this in terms of its architectural and historical significance. We dutifully visited 4 of the 5 Sierra Gorda missions, giving them half a day within a very crowded schedule. The visits were pleasant enough but only now on our return home can I fit them into the overall picture. The Sierra Gorda is wild, relatively empty country and a World Biosphere Reserve “for its eco-diversity due to its … position at the meeting point of the Nearctic and Neotropical bioregions. (It) presents great physiographic complexity, with altitudes ranging from 300 meters above sea level … (at) Jalpan … to 3,100 meters … at the summit….”. The drive from the city of Queretaro, set in the hot plains of Mexico’s “bajio” to the Sierra Gorda Missions takes you to the summit referred to above and then down to the town of Jalpan. With stops, for instance, at the Tentative List site of “Bernal”, it will take you best part of a half a day on a hard and twisting drive. For the sort of geographic reasons implied above and because of continuing conflicts over silver etc this land wasn’t pacified and settled until much later than other parts of Mexico and maintained a dispersed, partly nomadic and un-converted population. Later on in our trip we were to visit the inscribed Missions “on the slopes of Popocatepetl” (see my review). Those were being created as early as 1533. Yet the missions in the Sierra Gorda were not set up until around 1750/60. I certainly hadn’t understood the long timescale involved in the evangelization of Mexico’s interior and didn’t at the time I was there. Yet knowledge of that is key to understanding the Sierra Gorda Missions and their architecture! So, to see some/all of the Missions, first make for Jalpan. It has a couple of hotels and we found the “Hotel Mision” perfectly acceptable (if a bit noisy). As its name suggests it is set right in front of the first of the Missions. We visited it both in the evening and the following morning but then decided to miss out Mission Conca situated about 25 kms north of Jalpan on route 69 towards Rio Verde. Instead we continued west along route 120 (the road from Queretaro) first to Mission Landa and then further along by return side trips to Mission Tilaco (about 16kms south off the main road) and Mission Tancoyol (about 25 kms north off the main road). From there we were making for Xilitla and the coast. Leaving Jalpan at 9am we reached Xilitla at 1pm. Unfortunately all 4 of the missions we saw (Mar 2008) had their baroque façades partly obscured by scaffolding (photo 1) – it appears that a program of restoration of all of them is in progress. Whilst this hindered photography it didn’t totally prevent appreciation of the wonderful indigenous decoration and I can now review my photos in the light of additional study. All the missions were Franciscan and “naif” stucco work showing, what I understand to be the stigmata of St Francis, were a common feature on all the church facades (photo 2). The Fransiscans also built some of the “Popocatepetl missions” over 200 years earlier – notably Cuernavaca and Huejotzingo but to a very different style. Having experienced both, we can now see how the “imposed” fortress-like medieval architecture of the earlier was replaced by the innocence and beauty of indigeno forms in the later! Interestingly, the guy who built the Sierra Gorda Missions, Junipero Serra, went on to found San Diego (Yes “that” San Diego!) mission in California and was beatified in 1988. The mission interiors were all fairly simple – partly a reflection of the style but also a result of the anti-clericalism of Mexico’s Revolution which had led to the destruction of altarpieces etc. Outside we saw the “atria” which we were to come across later in the Popocatepetl monasteries – the large open air squares where the “Indians” would congregate for services. The importance of the decorated façade which looked out on this “congregation space” is now clear. The villages in which the missions were set – especially the “cul de sacs” of Tilaco and Tancoyol (Jalpan and, to a lesser extent, Landa are small towns now) were particularly interesting. These will have grown from the first settlements created as the Franciscans persuaded groups of “Indians” to come in and set up huts around the missions - we found Tancoyol in particular very “Mexican” and enjoyed the atmosphere around the church and market. In conclusion; it pays to do some studying beforehand when visiting WHS but the reality is that, until you have been, it is difficult to know what is going to be significant. I am pleased we managed to see both sets of Mexican WHS missions – and a bit more study and reflection on our return has helped increase understanding of each. Hi, I go to la Sierra Gorda every year with my family from the US. We have been about everywhere we can think of and every time we hear or find out about a new place to scout. If you want to meet friendly, simple people, this is the place to go. You are better off spending at least a couple of days over there for there is so much to see and so many places to go to. As you go up the mountains coming from Queretaro, you'll find desert and forrests until you get to the highest point at Pinal de Amoles and then as you go further and start descending you'll find warm, hot and humid climates. And all of this within a couple of hours travel!. Only here you can experience this. The Sierra Gorda is a majestic place that will put a spell on you and will have you coming back. Here you can find creeks, small rivers, big rivers, waterfalls, caves, forrests where you can walk for hours and just be one with nature. If you really like nature and beatiful landscapes, you have to go to la Sierra Gorda. I`m from Quéretaro, a colonial 1'000'000 people city, capital of the state where the sierra gorda. The sierra gorda is about 4 hour drive from mexico city, and 2 hours from queretaro, there are exelent paved roads to get there but very sinuous re member the word "sierra" means "chain of mountains" it is magnificent, climate ranges from hot to cold in a blink, the five missions are in perfect condition and have no entrance fee, the sierra has deserts, woods and even jungle-fores, and the missions are wisely dispersed so if you visit all five which could take from 2 to 3 days you have to carry a light jacket as well as short pants, swimig suit and anbrella, because you`ll be in all types of weather. there are nice places to stay an accesible hotels in Jalpan and Conca missions only, on the others overnight staying would be only for tent campers. people is warm food is cheap, and beautiful landscapes, rivers and caves complete the journey. conca mission has a closeby place where two rivers meet one with cold and one with warm water, making it a must to carry your swimsuit. 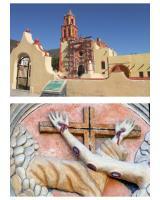 Minority communities: The missions were built for Chichimeca, Otomi and Huasteca who still inhabit the area.